After sitting out the national competition last season, four-time champion Gaz Whiter has made a return to the Link ECU D1NZ National Drifting Championship grid this year — now backed by Smartcookie8.com. Gaz is driving his latest build, an S14, that he never intended to contest D1NZ with, but with father Tony Whiter carrying out a host of upgrades, the car is proving to be a serious contender already. 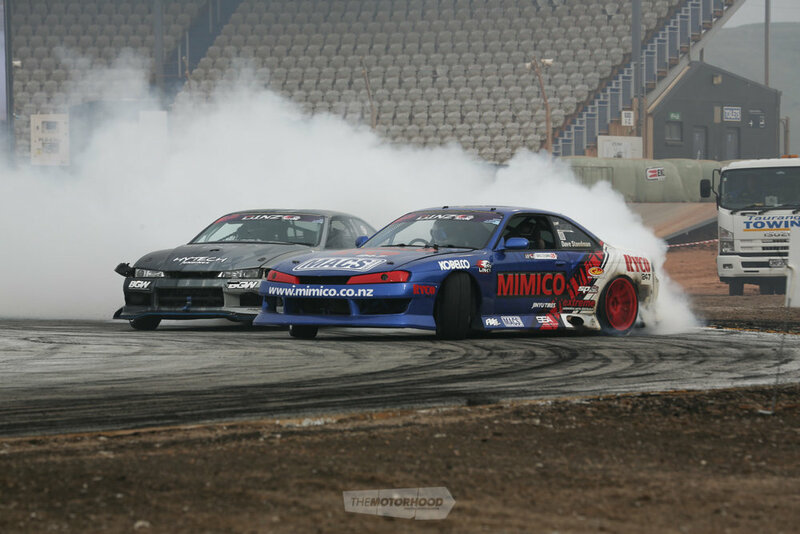 The S14 runs a Hytech Engines–built LS3, which has gained a K1 Technologies stroker kit, and Harrop supercharger. However, the real talking point concerns the custom eight-into-one headers, fabricated by Greg Smith Engineering and Western Blasters. With two-inch primaries merging into a 3.5-inch collector, before entering a four-inch system, this thing sounds insane! With the eight-into-one collector taking pride of place in the front of the engine, the radiator has been shifted to the boot, which caused the team heat issues at Mad Mike’s Summer Bash. This has been remedied with new fans, and a CVR Extreme electric water pump imported from the USA. Other upgrades include a Winters Quick Change rear end with Driveshaft Shop axles. The car already had a G-Force GSR box and Wisefab lock kit, so it’s good to bang doors with the best of them. In typical Gaz style, he is pretty laid back in his approach, but make no mistake — he is a very serious podium contender. The car launched at Big Boys Toys with its new livery courtesy of Big Brown last year, and Gaz will be running on Tri-Ace Racing Kings for the season. Who's your money on this season?